This is about the rest of us. Ayanbedejo and Kluwe highlight the paradox of athletics in America. We love when athletics becomes activist and changes our society. For evidence, see the case of Jackie Robinson. Breaking baseball’s color barrier was a major accomplishment for the civil rights movement and helped move America forward. The film 42, which essentially serves to further lionize and deify Robinson, made over $27 million in its opening weekend. Yet, we hate it when athletes become activists. Muhammad Ali was stripped of his title for his Vietnam War civil disobedience. 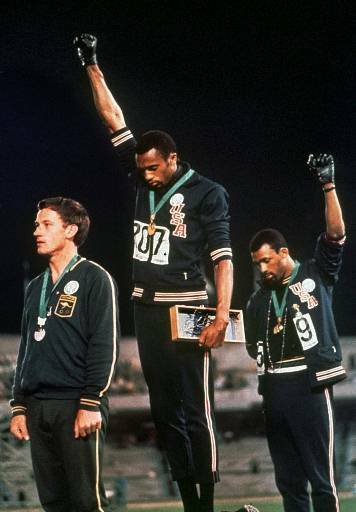 Tommie Smith and John Carlos were expelled from the Olympics for protesting civil rights. Dozens of times, I’ve heard cries for Kluwe to “Just do your job!” as though one must have a civil rights job in order to speak in their favor. We, the America public, don’t want athletes to make us think. We want them to distract us. We believe athletes have freedom of speech, as long as they aren’t too loud about it. We like “polite” activists, not pushy, “uppity” ones. Perhaps this is where NBA journeyman Jason Collins will succeed. He’s not especially outspoken nor does he seem like he wants or needs the spotlight. This is the Jackie Robinson model: Be who you are and just do your job. Of course, the reality is that Ayanbadejo and Kluwe are doing their jobs, just like Robinson and Ali before them. Their job, as citizens and patriots, is not to avoid distracting you from the “real” world, but to improve that world. And there is no way to do that without speaking out. If you can’t handle athletes doing their jobs, perhaps you should shut up and do yours. This entry was posted in Domestic Policy, Sports and tagged 42, Brendon Ayanbadejo, Chris Kluwe, Civic Responsibility, Civil Rights, Do Your Job, Gay Rights, Jackie Robinson, Jason Collins, John Carlos, Muhammad Ali, Tommie Smith, tommie smith and john carlos by Rites of Patches. Bookmark the permalink.